Ladbrokes is a British bookmaker that was founded in 1886. The company expanded into Australia in 2013 with the purchase of Betstar and Bookmaker.com.au. They are licensed and regulated by the Northern Territory Government in Australia. The point of downloading a mobile betting app is basically for betting anywhere with an internet connection and mobile specific features. 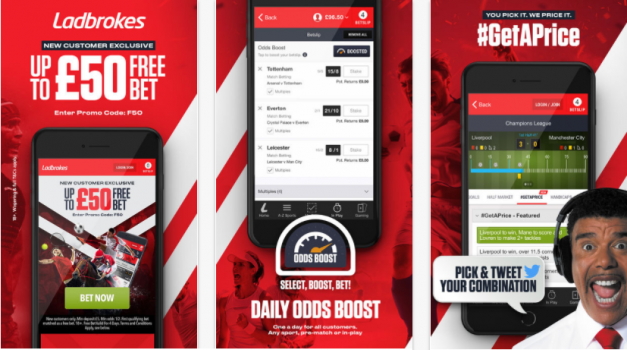 In regards to the Ladbrokes app, it is easy to navigate and provides all the basics for a mobile app, while also providing unique features. The unique features include MultiMaker, Featured Bets and Quickbet, which are exclusively available on the app. Banking – The banking options at this bookmaker are plentiful. The deposit options are well covered and they have a bookmaker card. They also have four different withdrawal types: EFT, Bookmaker card, BPAY and PayPal. Featured Bets – Shows suggested bets, favourites and market movers for racing in Australia during the day. Live Streaming – All of your favourite NBA, NBL action and more, live on your mobile device. Live Betting – Live in-play betting is available and I can bet on a wide range of sports. They cover AFL, NBA, NFL, NRL, cricket, soccer, tennis and more. MultiMaker – Create sports multi-bets in a few, easy taps. Racing – Place a bet on horse racing, harness racing and greyhound racing both in Australia and Overseas. They also have weekly betting promotions for Australian racing. Summer Sports – Bet on Basketball (NBA, NBL), Cricket, Soccer and Tennis during summer. Winter Sports – Bet on the AFL, NRL and Super Rugby during the winter season. They also offer weekly betting promotions on these sports. US Sports – Promotions and betting markets are available for MLB, NBA, NFL, NHL and Major League Soccer. The advantages of betting on the Ladbrokes app are the unique features available. This includes wide variety of banking options, featured bets MultiMaker, live betting and live streaming. The pin-code login is a nice feature that allows users to login with a four digit code rather than entering a password. The overall design of the mobile app provides a similar betting experience compared to the desktop website. They use the same red and white colour scheme from the Ladbrokes logo, with touches of black as well. The app can be easily downloaded from the Apple App Store on compatible Apple devices. While on Android, the app download process takes a bit longer due to the Google Play Store not allowing betting apps. Visit the Apple App store and search for “Ladbrokes”. Open an internet browser and navigate to https://m.ladbrokes.com.au/. The Ladbrokes app is simply designed with a focus on navigation and ease of use, two main factors I look for in a mobile app. Tapping through pages is quick and smooth. I can easily find betting markets or promotions from the homepage and main menu. The bet-slip can be swiped in from the right hand side of the app to view pending bets. Otherwise, I have the choice of using the “Quickbet” feature via the my account section. Which I would turn on, since it makes betting a whole lot quicker on the one screen, instead of multiple steps. This bookmaker provides the ability for watching live racing at selected tracks during the week. As well as live NBA and NBL games during the season. The app is regularly updated with performance improvements, bug fixes and security updates. How to bet on sports using Ladbrokes betting app? Betting with a mobile app requires installation of the app onto a mobile device. The Ladbrokes app can be downloaded onto an Android device using a QR code app. At Ladbrokes, the betting markets widely cover sports and racing. But I would say they’re more suitable for betting on the races. The promotions are generally geared towards races in Australia with odds boosts and enhanced odds. They also live stream races in Victoria and South Australia. Along with exoctic bet types, this bookmaker is recommended for racing punters. However, they do provide weekly sports promotions for both Australian and Overseas sporting events. These can include NBA, EPL and NFL for International sport fans. In Australia, they have betting markets for all popular sports, whether it’s Summer or Winter. They also have promotional markets available per game during the AFL and NRL seasons. Credit Cards – Deposit funds with a Credit/Debit Card. Visa and Mastercard are available. PayPal – Login to my PayPal account and add funds. Ladbrokes Card – This bookmaker offers a visa card for depositing money into an account. Cash In – Top up a Ladbrokes account in participating newsagents in Australia. Flexepin Voucher – Deposit with cash in participating outlets in Australia. In this review, I found that Ladbrokes is more suited for betting on racing with the promotions, live streaming, featured bets and overall betting features. The mobile app is also designed primarily around racing as it takes up most of the homepage space and promotions page. But Ladbrokes would also suit a novice sports betting fan. The multi maker makes it easy to create quick multi-bets. They also live-stream NBA/NBL games for example and provide adequate sports betting promotions during the year.